Luzhi ancient town is in Kunshan city, about 25 kilometers away from Suzhou. The town is around 1 square kilometer. It has a long history of more than 2,500 years. The town is characterized by small water lanes, stone bridges and the riverside ancient buildings. There are about 41 well preserved ancient stone bridges of different styles and size. These highly distinctive bridges include multi-arched big bridges, solo-arched bridges, well-ornamented and twin bridges with the two bridges look almost the same. Suzhou-Luzhi: There are many buses from Suzhou to Luzhi. Tourist bus departs from Suzhou railway station for Luzhi daily. Suzhou north bus station also offer bus services to Luzhi. From 6:30am to 6:30 pm, a bus leave the north bus station for every 30 minutes. Ticket price is 7 Yuan/per person. Tongli-Luzhi: Luzhi is about 65 kilometers away from Tongli. 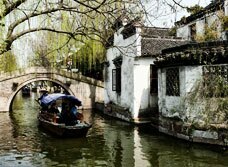 Travelers can take a tourist bus from Tongli to Luzhi for about 12 Yuan. Ancient Bridges: Luzhi have been renowned as the "Museum of Ancient Bridges". 41 bridges in the town display different styles, sizes. These stone architectures have been standing there for thousands of years through natural corrosions. Boashen Temple: It is a buddhist temple first buit in 503BC. The original complex was destroyed by wars in the late Tang Dynasty. The building visitors see today is architecture of the Song Dynasty. The temple was once very popular in that region and in its peak time. There were over 5,000 chambers and thousands of monks in the temple. Shen&apos;s House: Built by a weath merchant in the Qing Dynasty, Shen&apos;s house shows the typical residential complex of rich people of that time. Wanshen Rice Shop: A influential rice shop in the Qing Dynasty. All things here have been arranged to its original style.